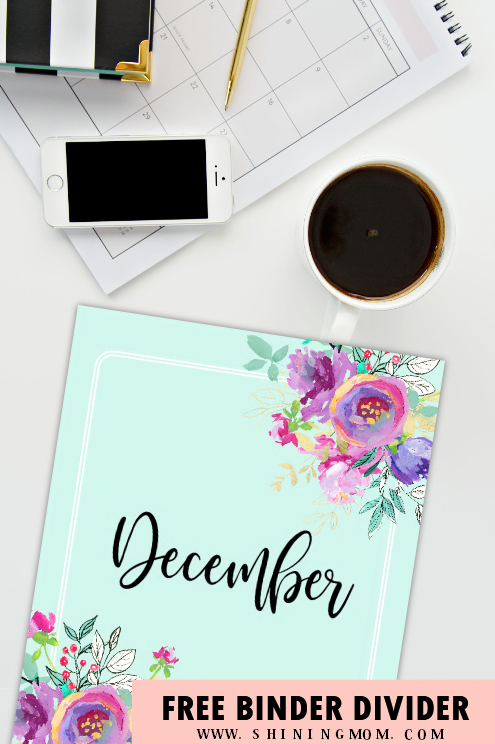 Free Printable Binder Dividers for All The Months of the Year! 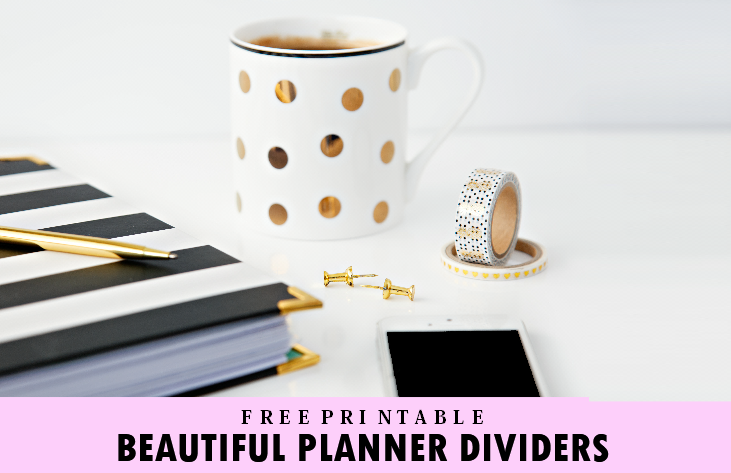 Because you’ve already enjoyed hundreds of free planners for your binder on the blog, I thought you’d love to have a free printable binder divider from me, too. And so today, I am giving away a complete set of free monthly planner dividers that you can snag right away! Hello, friends! Welcome back to Shining Mom! You might have realized that I don’t typically post on weekends, but I decided to roll out a free printable binder divider today because I woke up extremely overjoyed and grateful after reading about 20 emails sent straight to my inbox from my readers all over the world, expressing how much they appreciate all the freebies I share. You, ladies, you make my heart flutter in joy! Know that while all the organizers I share bless you in ways beyond my imagination, you are also blessing me and my family. This blog is thriving and growing beautifully because of all of you! Since it’s a weekend and the momma here has loads of chores and errands to do, I shall make this post short and sweet. Without further ado, let me show you another set of freebies that I am pretty sure you are going to love just the same– your free printable binder divider! 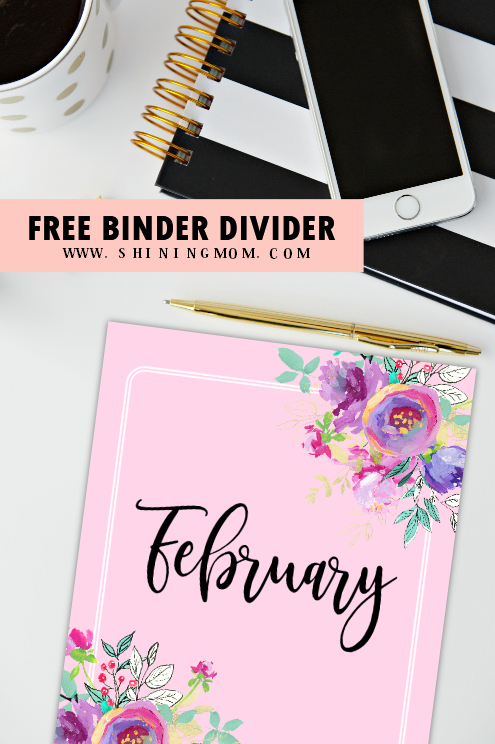 The binder divider for February comes sweet in muted pink! Won’t this inspire you to sprinkle love in the air, well, monthlong? The March divider comes refreshing in mint tint! Ready to plan out an awesome month with this? 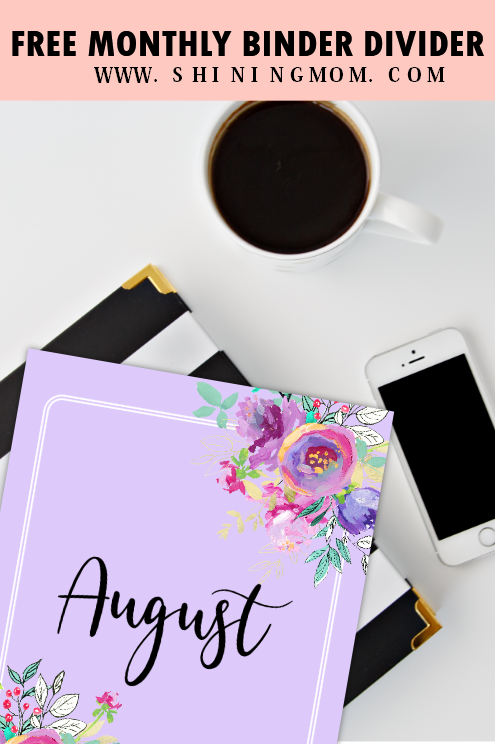 The August binder divider comes in happy purple background which happens to be the color of the year! It looks so elegant and endearing at the same time, isn’t it? Well, these are just some of the free monthly planner dividers that you can use from the file that you are about to receive. You can view the rest of the planner dividers in your download! 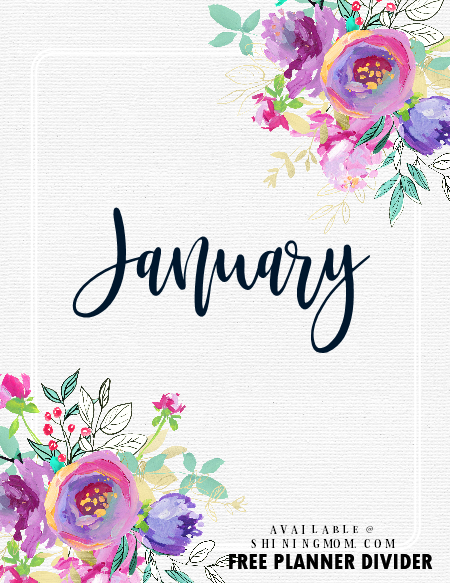 Would you love to use a monthly themed planner divider in glorious florals? I will send it straight to your inbox right away by joining the mailing list HERE. Your membership to the Shining Mom mailing list also entitles you to receive exclusive freebie updates so you will not miss any again! Would You Like Use the Second Version of Our Free Printable Binder Divider, Too? If you like to use this design for your binder cover, do let me know because I am rolling out a little game here! Yup, let me know at the Comments if you’d like a complete set of the binder dividers in textured white paper background so I can update this post with the link. I would love to here from you, too– that’s why! I am just waiting for about 8 requests from my readers’ end. Easy peasy so make yours count today! But hey, friends, the version 1 is already available for printing Okay? In case you missed the link to the source earlier, it’s right over HERE. Print your free binder divider now or this pin this post in Pinterest to use later! P. S. You might also like to view my most-loved free organizers such as The 2018 Foral Calendars and Planners and The Ultimate Budget Binder. I’m pretty sure you’ll love them, too! « FREE Valentine Cards: 40+ Cute Designs to Love! I love the white background floral month dividers! Hi! So happy I came across your website! Do your printables come in personal size planners? I really hope you do! Would love to print your pieces. Please please please! Thank you! Love the dividers! Thank you so much for sharing these. I would love the dividers with the white textured background too. How generous of you to share these with your readers. Thanks so so much .This is my first time and been wanting to start.Now I am going to see about the planner. Thanks, Rose-Ann! Good luck in planning! You are amazing. Thank you so much for all the details and precious and beautiful work. You’re welcome, Olga! Much love! Yes, the white is pretty but will use less colored ink. Thank you so much for sharing! I love the textured background version! Love both Sets. The white is beautiful? Thank you so much for all the beautiful planners that you share here. I have just found your page recently since I was researching about planners in Pinterest and you got me hooked to doing my own planner now! I would love to see the white background of the dividers too! and by the way, can I also print these dividers in A5? Thanks again!